Topshop's second bPay collection of contactless payment accessories has just landed in its UK stores and online. There's six pieces - two bracelets, two phone cases and two robot keyring trinkets - with prices ranging between £25 and £32 including a bPay NFC chip. The metallic and snakeskin effect accessories are being billed as the "luxe", premium collection following last year's bright and funky Monster Fish series. And they do look damn stylish. This cheaper collection, which starts at £15 for stickers, is still on sale and it's worth noting that Topshop is giving the bPay wearables a nice push on its homepage. 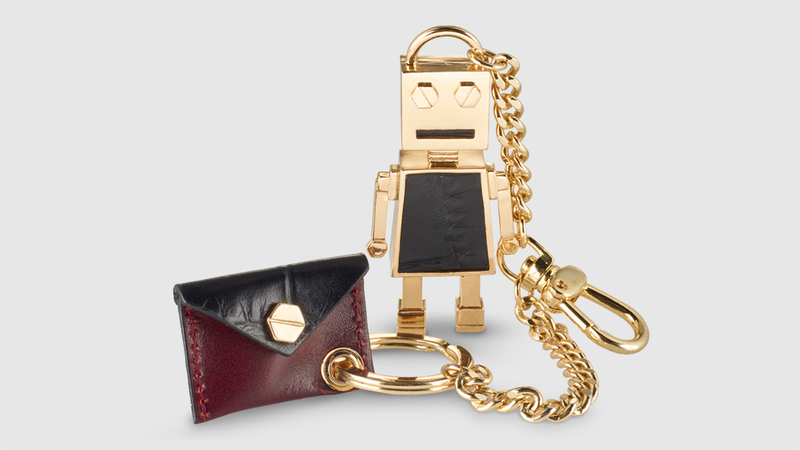 We actually got a sneak peek at the new robot keychains on the Visa booth at this year's MWC. You can use bPay, a rival to Apple and Android Pay, if you have a UK-registered Visa or MasterCard. You don't actually need a Barclaycard or to bank with Barclays. And like smartwatches with payment functions, you can tap them to terminals wherever you'd use your contactless card, for anything up to £30, once it has been topped up with between £5 and £200. The second iteration of the partnership comes as we wait to find out which wearable tech startups have made it through to Topshop's one month long Top Pitch bootcamp, which runs from 13 June. The winner will present to boss Sir Philip Green and get the opportunity to secure investment and for Topshop to stock the product. Head to Topshop.com if you're interested in the new bPay wearables.